Archaea inhabit some of the most inhospitable environments on the Earth. Extremophile archaea hold several biological records: for living in the hottest places (121 degrees C), most acidic environments (pH 0), and saltiest water (about 30%). Other archaea, however, live in more mundane homes, for instance, living alongside bacteria in the oceans and in our gut. The widespread success of archaea is due in part to their unique membranes, which form the primary boundary between them and their often hostile surroundings. Like other living organisms, archaea are surrounded by a membrane composed of lipids. Biological membranes need to have a few functional properties. They need to be fluid, to allow proteins to move around and to respond to external deformations and damage. At the same time, they need to be impermeable to protons and other charged ions, to allow formation of the electrochemical gradients that power life. The lipids used in our cells have these properties, but only in a narrow range of comfortable temperatures. Archaeal lipids, on the other hand, form membranes with these properties over a wide range of temperatures, from freezing cold to boiling hot. Like other lipids, archaeal lipids are build around a molecule of glycerol, with a phosphate attached at one point and two long hydrocarbons attached at the other two points. Archaeal lipids, however, have several differences that provide their enhanced functional properties. 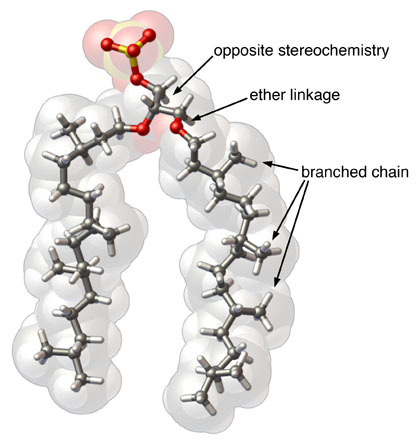 The hydrocarbons are attached through an ether linkage, which is more chemically stable in extreme conditions than the ester linkage used in our lipids. In particularly extreme cases, longer hydrocarbons are used and glycerol is attached at both ends, forming a super-lipid that spans the entire membrane. The hydrocarbons are also composed of branched carbon chains, instead of the straight chains used in our lipids. These pack more tightly inside the membrane, making the membrane less permeable to small molecules. Archaeal lipids also have an additional difference: the phosphate and hydrocarbons are attached in different places on the glycerol, leading to a different stereochemistry of the central carbon atom. This doesn't have a huge effect on the function of the lipid, but it is a distinguishing feature of archaeal lipids--this stereochemistry isn't found in any other organisms. The enzyme shown here, from PDB entry 2f6x, performs the reaction of adding the first lipid, then a second membrane-bound enzyme adds the second hydrocarbon. The unusual branched hydrocarbon chains are created in several steps. First, a long isoprenoid chain is created, using enzymes similar to ones that create the precursors for cholesterol in animal cells. Then, the enzyme shown here (PDB entry 3oz2) removes all the double bonds in the isoprenoid chain, creating the long branched chain used for the lipid. 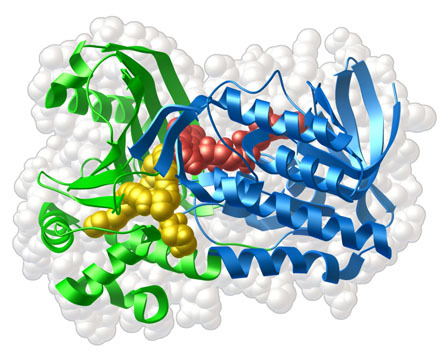 PSI researchers at JCSG have solved the structure of this enzyme, revealing a large active site that positions the lipid (yellow) next to an FAD cofactor (pink), which performs the reaction. 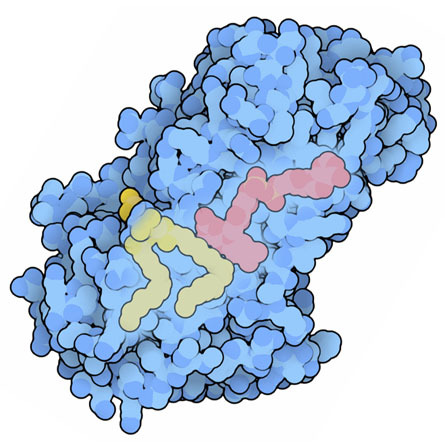 To take a closer look at this enzyme, the JSmol tab below displays an interactive JSmol. This enzyme performs the last steps in the synthesis of archaeal lipids, removing double bonds from the hydrocarbons to form long, flexible, branched chains. Analysis of amino acid sequences revealed a sequence motif that is unique to this class of enzymes. This includes three bulky amino acids (tyrosine 209, tryptophan 211 and phenylalanine 213) shown here in bright green. These amino acids are important for positioning the lipid bond that will be desaturated. The motif is flanked by two conserved prolines, shown here with a darker green sphere on the backbone, which presumably are need to position the protein chain in the proper place. The lipid is shown here in yellow and the FAD cofactor is in pink. 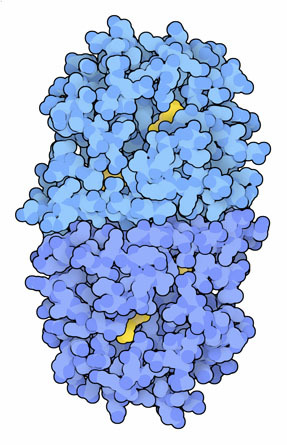 The protein is shown with a thin backbone representation, with the FAD-binding domain in blue and the lipid-binding domain in green. If you look carefully, you'll find that the lipid is actually a bacterial lipid, not an archaeal lipid, which was presumably captured by the enzyme when JCSG researchers expressed it in bacterial cells. Xu, Q. et al. Insights into substrate specificity of geranylgeranyl reductases revealed by the struture of digeranylgeranylglycerophospholipid reductase, an essential enzyme in the biosynthesis of archaeal membrane lipids. J. Mol. Biol. 404, 403-417 (2010). Ulrih, N. P., Gmajner, D. & Raspor, P. Structural and physiological properties of polar lipids from thermophilic archaea. Appl. Microbiol. Biotechnol. 84, 249-260 (2009). Payandeh, J., Fujihashi, M., Gillon, W. & Pai, E. F. The crystal structure of (S)-3-O-geranylgeranylglyceryl phosphate synthase reveals an ancient fold for an ancient enzyme. J. Biol. Chem. 281, 6070-6078 (2006). Chaban, B., Ng, S. Y. M. & Jarrell, K. F. Archaeal habitats -- from the extreme to the ordinary. Can J. Microbiol. 52, 73-116 (2006). Koga, Y. & Morii, H. Recent advances in structure research on ether lipids from archaea including comparative and physiological aspects. Biosci. Biotechnol. Biochem. 69, 2019-2034 (2005).